When I wrote my last blog post, almost a month ago now, I thought there was no way I’d ever possibly be further behind on race reports than I was at that time — at least that’s what I tried to promise myself. But, I was wrong, and I haven’t upheld that promise. To be fair, I had no idea quite how hectic things were going to get for me, or just how overwhelmed I was going to feel this summer. 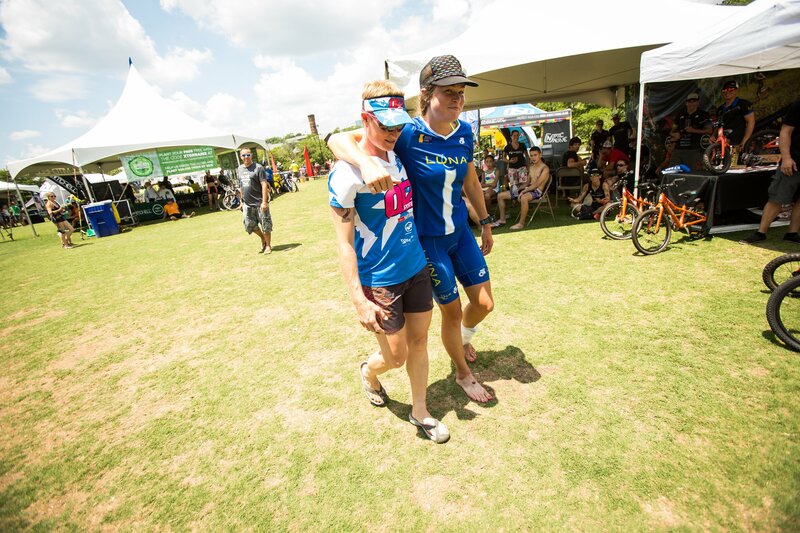 It’s strange to think about the Xterra East Championship now, because it happened all the way back in mid-June, but it was such a pivotal moment for me in so many ways, and I am still feeling the effects of that race — both good and bad. A part of me feels like that was so long ago, and another part of me feels like it just happened! Once again it seems somewhat irrelevant to write a race report so far ‘after the fact,’ but since I’m still very much working through the injury I sustained there, and also working on writing an update about that progress, I suppose it makes sense to go back and start from the beginning of this journey toward recovery. Following Raleigh I started a big training block to get ready for Vineman (Iron-distance) in July. I was doing a ton of volume and putting in some of the hardest work I had all season. Lindsay jumped right in, and did almost every single one of my workouts with me, right down to the longest rides and the hardest interval sessions. As someone who almost always trains alone, I cannot tell you how great it was to have a workout buddy to help me push through such a challenging couple of weeks, how much I appreciated it, and how impressed I was with her. I went to bed exhausted most nights, but I made some tremendous gains in fitness during that time, and Lindsay is a big reason I got through that training block so successfully and with so much joy. Thanks Linds (and you’re a STUD)!! Found some incredibly fun mountain biking in Georgia! When you sweat as much as I do, clothes do NOT dry in Georgia unless you hang them up immediately after your workout. When you run out of space from too many workouts, you have to improvise! The AMAZING pool at Emory where we put in so much work together… I miss this place! Last moment with Linds for a while. THANKS FOR EVERYTHING!!! Putting in the work for Vineman and focusing on other longer-term/big-picture goals was the priority those last couple weeks back east, even though Xterra East Champs was the next race on the schedule, and one that meant a lot to me. I really wanted to do well there, and had already been thinking about it for weeks — even before Raleigh. I knew there was a good opportunity there with a few less starters in the pro field than the previous races and a race course that plays to my strengths, and I wanted so much to be able to seize that opportunity and have the day I knew I could. It was tough for me to continue pushing so hard in my training and keep the “bigger picture” in mind as the race approached, but I trusted in my coach to help me get to the race feeling just rested enough to have a good day while still acting on the bigger plan. Somehow he always knows exactly what I need to be doing even if it’s not what I may want to do in the moment, and as tired as I felt at the beginning of race week, and doubtful that I could actually achieve my big goals, my body pulled up just in time — and just as planned — for race day. I was incredibly, uncharacteristically nervous coming into this race because my expectations were so high. I knew this was probably my best chance at finally getting on that podium, and also already one of my last chances for the Xterra season. 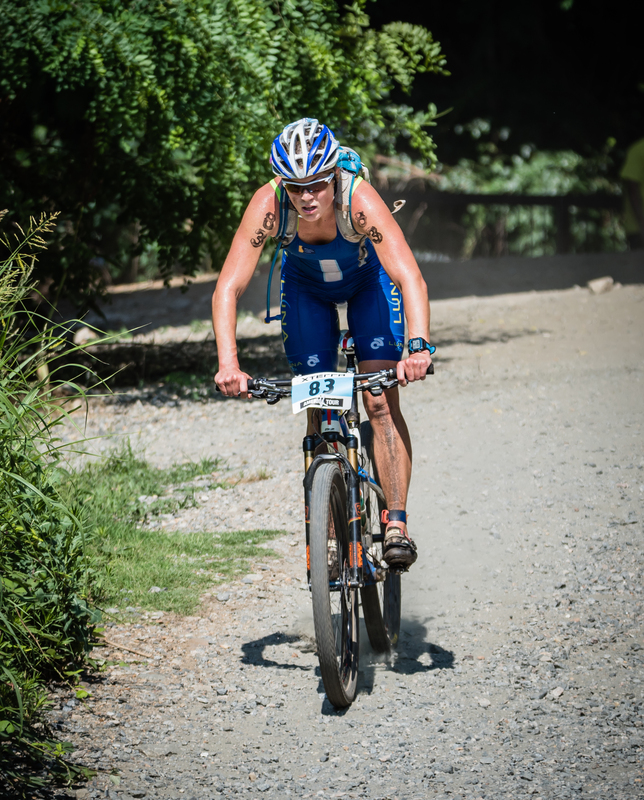 While this course suits me well, it is very challenging in that it’s far more technically demanding than any other Xterra course on the US pro circuit — primarily on the bike, but on the swim and run too. It’s an incredibly unique and special course, but it is downright tough! 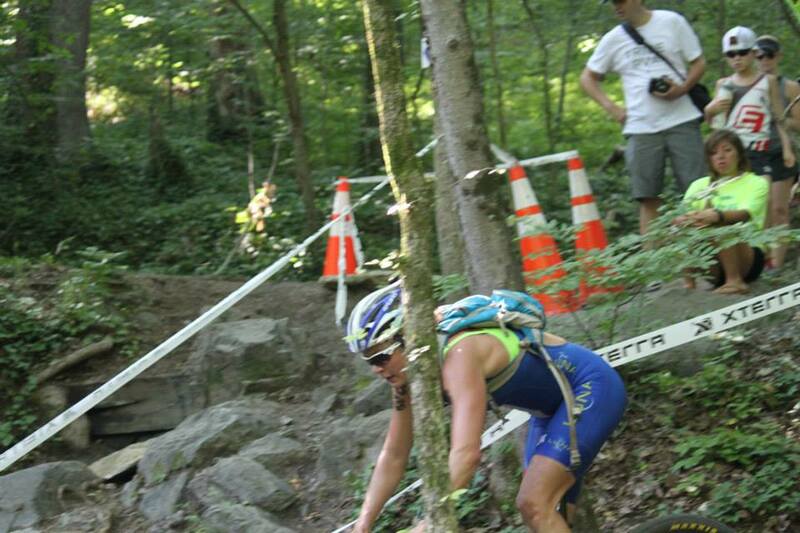 Last year I came in with high hopes and a lot of excitement, but I had a terrible day after getting stuck in the current of the James River in the swim, and then running into mechanical trouble on the bike after taking a hard fall. I felt a bit haunted by that experience, which made me more nervous, but I was also eager to overcome it. Last section of the ride, looking back into the city from the trails. Such a unique, fun setting! When you’re racing in an “urban jungle adventure,” sometimes you get graffiti art on your run route! 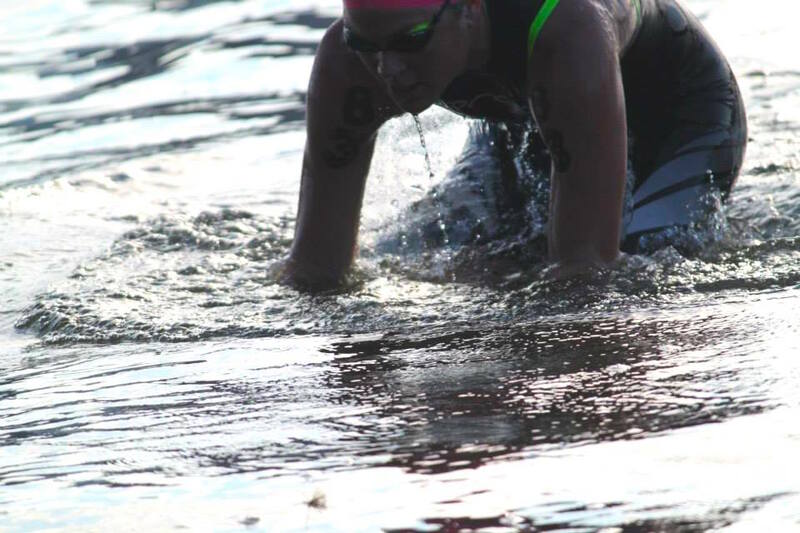 I made it across the James River with no major navigation or current issues and felt really strong in the swim, coming out of the water in 6th place, all alone. On the bike I rode hard, aggressively, and technically well (which I was especially psyched about!). 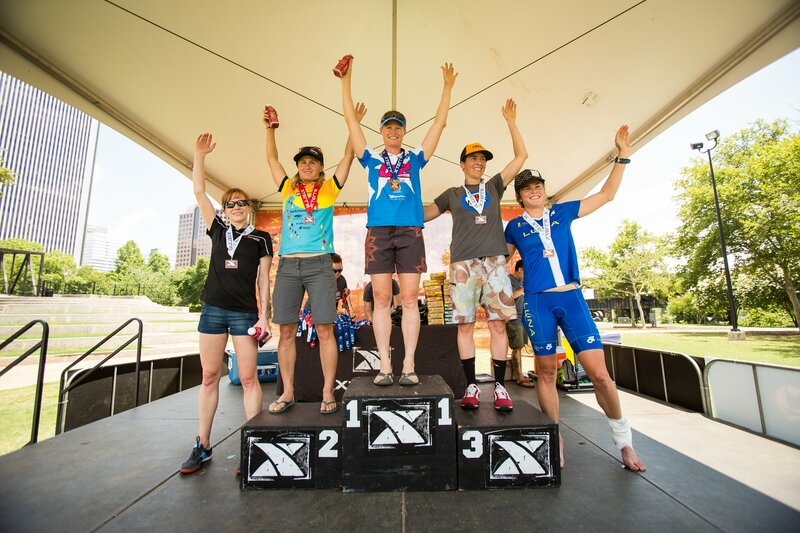 I passed two women on lap one to move into 4th, which got me fired up — I knew I was well-positioned to achieve my goals if I could hang in there! I rode with a tremendous sense of urgency to try to hold off the fast chasers behind me, but Maia was having an even better day behind and caught me at the beginning of lap two. This was actually totally great, as she is a really good person for me to ride with (very similar style and pace to mine, and very respectful on the trail!). We were able to work together to help each of us keep pushing harder, and after a few lead changes over the lap we came in quite close to one another, with Maia heading onto the run just ahead. This gave me a great carrot to chase after, as she is a phenomenal runner and was clearly having a terrific day, so I focused on keeping her in sight. I had no idea where anyone was behind me, but I was in 5th place, and I was going to do absolutely everything in my power not to give it up! I felt really good starting the run, but it got harder and harder as it went on (funny how that works…! ), and the temperature just seemed to get hotter and hotter! I refused to let myself think about anything other than how badly I wanted that podium and how close I was to this career-best day, and kept pushing as much as my body would let me, but the tank was draining fast! As my body got more fatigued, my mind fought that much harder to stay in the game and make up for my fading energy, and I felt desperate and frantic to get myself to that finish line. This was all a bad combination, and it manifested itself with just under 2 miles to go, as I was crossing the “dry way” of boulders back across the James River. My foot stepped one direction, but my brain was already on to the next one, and I landed on a twisted ankle and put all my weight down, hard. My whole foot went sideways underneath me in the most unnatural way, and I could feel everything stretch to try to accommodate it. It hurt, A LOT, and I knew it was bad, but I didn’t know just how bad. And in that moment I didn’t want know. I just wanted to get to the finish! Continuing to run was probably not a smart choice at all, but as usual in these kind of circumstances it was the only one I knew how to make, and while the thought of stopping briefly crossed my mind, there was just no way I was going to do it at that point. (Sometimes tenacity has its downsides!). Running hurt, but thanks to a whole lot of adrenaline and even more desperate desire, I was able to keep going, and after the first couple minutes I didn’t even process the pain anymore. All I could think about was making it to the finish line and maintaining my position. I knew I was running much slower, and I knew there were some fast runners chasing me down (thought I still had no idea how far back), and I kept envisioning my podium finish just slipping away from me in those very last moments, when I had come so close. The thought alone was heartbreaking, and that fear of just missing out helped drive me to the finish. I may have been hobbling, but I was running scared, and that provides an amazing amount of motivation. I had done so much to get myself to this position, and I did not want to give it up! When I made it to the finish, I was in total disbelief that I had actually still achieved my goal! I was completely elated, immensely satisfied, and even more relieved that it was over and I hadn’t had to watch the podium slip away from me. Major, happy breakthrough moment! Unfortunately though, I was also in a world of hurt. Yet again I was unable stay upright after I crossed the line, and I just laid in the fetal position under the finish tent misters (God bless whoever thought of this genius idea!!) as I tried to get my body to feel somewhat normal or at least less death-like after the all-out effort in 95-degree temps with equally brutal humidity. As much time as I’d now spent training and profusely sweating in the southeastern furnace, I totally thought I’d be more accustomed to it by that point, but it was really just as uncomfortably miserable as the first day I arrived, and my body clearly still hated heat as much as ever! I was so focused on trying to recover from the heat exhaustion that I almost forgot about my ankle, until I tried to stand up to go get ice from the med tent and realized that it had swelled up like a giant softball and I could put zero weight on it whatsoever! Suddenly I became acutely aware of how much it actually hurt sans adrenaline and fear, and once again it was back to the med tent for me! The swelling and pain got worse, and I knew things were not looking good. Immediately my thoughts shifted to what this would mean for me for Vineman and the rest of my season. I felt so nervous about what the implications might be, but I tried not to freak out before I had more information. The immediate focus became how I was going to get through the rest of the day in terms of getting out of the venue, making it back to Chapel Hill for the evening, and then making it back home. It all seemed extremely overwhelming at the time, as I was totally immobile and pretty much couldn’t do anything for myself. Fortunately I had a whole host of amazing people that stepped in to help me out: from Debby and Rebecca helping me in the med tent; to Suzie helping me make my way up to the podium so I could finally have that moment I’d been waiting for (which was perfect in so many ways, really, because it was symbolic of all the other ways she’d helped me get there); to the amazing team of George, Kelli and Catherine helping me get all my stuff from the venue, driving me back to my homestay and literally carrying me inside; to Josh and Lora, my fabulous hosts, doing everything they could to make sure I was as comfortable as possible and helping me get organized and ready to go (right down to washing my bike for me! ); to Allie already making plans back in North Carolina abut how to help me tackle the next steps of getting home. I am so tremendously grateful to all of you for helping me out and making me feel so supported, and truly can’t say thank you enough! Table-sized dosa nearly gone! SO delicious! 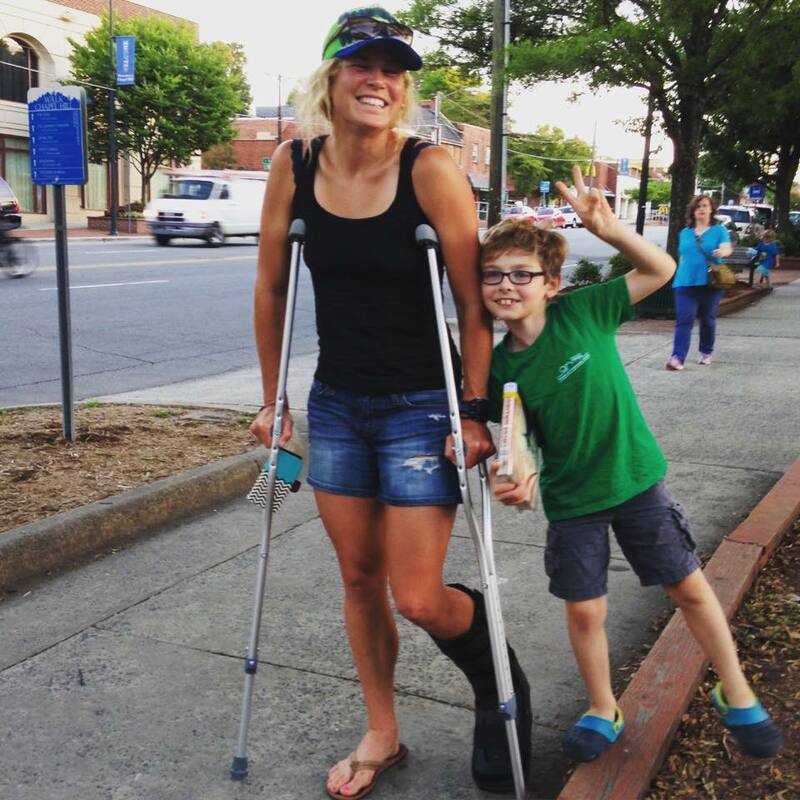 I managed to make it back to Allie’s in Chapel Hill that evening, but driving a manual car with a bum left ankle is no easy feat! The following day I was supposed to drive all the way back to Atlanta (6 hours) and then get on a plan to fly back across the country. Clearly that was not going to happen, and by the time I arrived at Allie’s she had already made a doctor’s appointment for me the next morning and was working on getting my flight changed — talk about ultimate hero status! 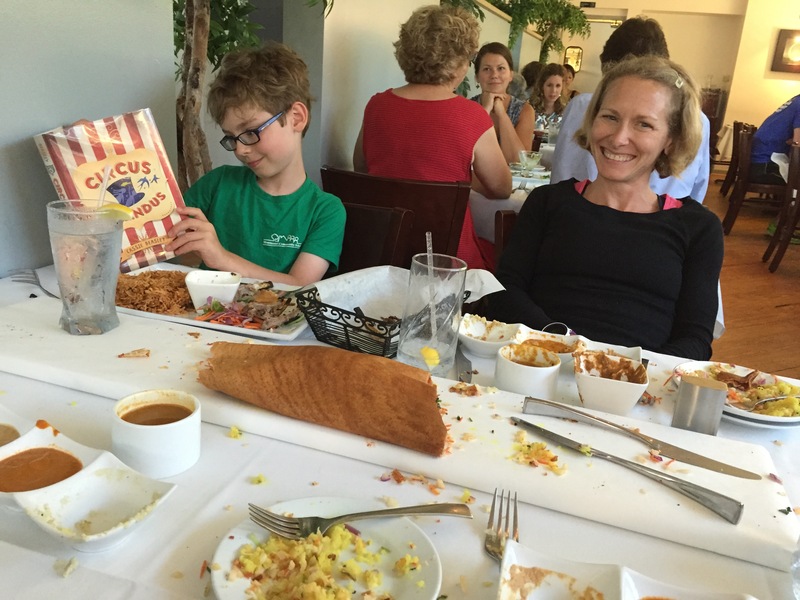 The blessing in disguise was that I got to spend an extra day-and-a-half with her and Z in NC, and we even got to eat the table-sized dosas we had missed out on when I was there for the 70.3. BONUS! Allie took amazing care of me and it was so great to have some extra time to relax and start to recover before having to think about all the next steps. I left NC in a boot and on crutches, on a new schedule (thanks to Allie’s truly remarkable negotiation skills and some refreshingly great accommodation from Delta) that enabled me to drive to Atlanta a full day later, and then not have to fly out until the following morning — SO much less hectic! I got wheelchair service all the way through the airports, which was awkward since I’m pretty sure I was the only person under 85 using this service, but also awesome because I got to by-pass the security line, and there is absolutely no way I could have possibly gotten through Atlanta airport without it. I was so, so happy to finally make it home after such a long time away, and eager to start working toward getting recovered and moving forward. Coming home injured was absolutely no fun, but I also came home so satisfied with finally having the breakthrough I’d been waiting for, and a lot of great training and hard racing in the bank! It was an amazing trip, and I have so many people to thank for making it possible for me to do all three races out there, achieve my goals, and learn some great lessons along the way. Extra thanks again to Lindsay for putting up with me for so long, to Allie for going above and beyond for me, and to Lora and Josh for graciously opening up their home to me in Richmond!! Once I was back, so began the emotional rollercoaster of working through the injury, trying to make it to Vineman, and continuing to await full recovery. That’s a journey I’m still taking, and it has been a tough one! More to come in the next post…!! WOW. You are amazing…don’t think they make em any tougher!